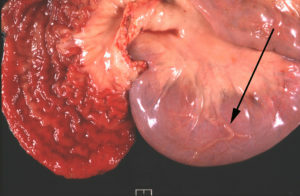 Classical lesions are a thickened, corrugated mucosal surface of the ileum and dilated lymphatics on the serosal surface (arrow on adjacent image). This exceptional photo was taken by Dr. A.J. Cooley and has appeared in several publications. 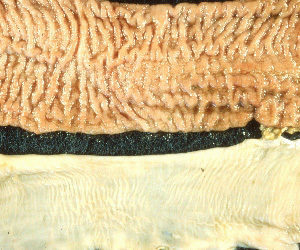 This photo provided by J.B. Jorgensen, State Veterinary Serum Laboratory, Copenhagen, Denmark, shows the thickened and corrugated mucosal surface of the ileum (top) in contrast with a normal ileum (bottom). Photo taken by a veterinary student, named Stephanie, during a clinical rotation in a U.S. slaughterhouse. 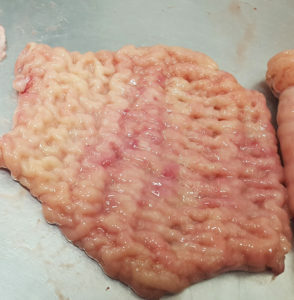 She sent me this photo and indicated that it was very common to see cattle with this obviously thickened intestine. Prominent Peyer’s Patches on the surface of the ileum (raised slightly red tissue in the center) from a cow wit clinical Johne’s disease. Prominent mesenteric lymph nodes (arrow) from an Angus cow with clinical Johne’s disease. Cross section of an enlarged lymph node near the intestinal tract. Such lymph nodes are typically smaller and on cross section a uniform brownish liver-color. This lymph node is enlarged and has accumulations of while blood cells around the periphery of the lymph node indicative of the inflammatory response taking place here. In goats, thickening of the intestinal wall is not as pronounced as it is in cattle with Johne’s disease. 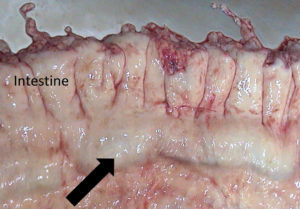 Prominent mesenteric lymph nodes (arrow) adjacent to the small intestines of a sheep with clinical Johne’s disease (photo by Dr. Suelee Rob-Austerman). 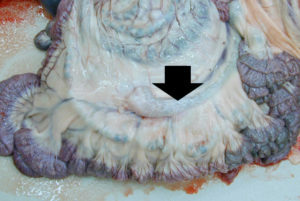 Serosal (external) surface of the small intestine of a sheep with clinical Johne’s disease showing the prominent lymphatic vessels (thin white lines). 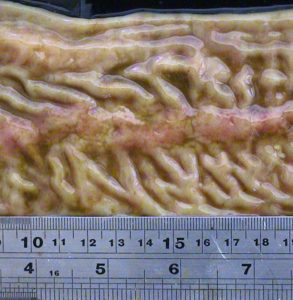 Thickened and corrugated ileum of a sheep with clinical Johne’s disease. 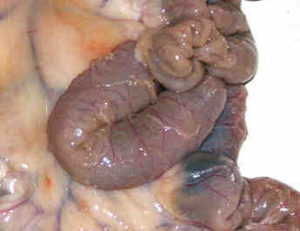 Intestinal thickening is less dramatic and less often seen in sheep as compared to cattle. This is an excellent image was provided by Dr. by Suelee Rob-Austerman. MAP infection causes chronic granulomatous inflammation that leads to visible changes in tissues. Intestinal thickening and enlargement of lymph nodes near the intestines caused by influx of white blood cells are commonly observed.